In preparation for the event, I read the first volume of New Asia Now, including Syjuco’s, Sheng’s, and Zaidi’s contributions to the issue. Syjuco’s essay “Beating Dickheads” rails against the brazen lawlessness and rapacity of the Philippines’ politicians; Sheng’s story centers on the plight of a pregnant unwed mother in China, where childbirth out of wedlock is illegal; and Zaidi’s “Embodying Venus” ruminates on how women in contemporary India are taught to regard their own bodies with shame. Miguel Syjuco stressed the need for writers to resist self-censorship—to say, without flinching, whatever they want to say (regardless of what offense they may cause or ire they may provoke). Sheng Keyi noted the ability of writing to give voice to brighter alternatives to grim realities—to replace tragic ends with improbable happily-ever-afters, and in doing so, to bring such happy endings into the realm of the conceivable. Annie Zaidi spoke of the writer’s ability to give voice to victims that society would rather silence. The evening’s discussion also reminded listeners how ironic it is to publish abroad to effect change at home. Schultz suggested that the publication of these pieces in an Australian venue might have enabled the Asian contributors to be more outspoken in their critique of situations in their home countries. Zaidi affirmed this, saying she felt a certain freedom in not having to anticipate the resistance and counter-argumentation that an Indian readership would inevitably offer in response. Syjuco noted that living in Canada has afforded him the emotional distance necessary to write about the social ills back home—ills that pained him to the point of incapacitation while he was living in their midst. He also acknowledged that writing such a critique at a physical remove was undoubtedly a luxury, lauding the courage of writers who remain in the Philippines and dare criticize the powers and norms that reign. I enjoyed participating in the event as an interlocutor, and it was particularly exciting to converse with an author whose work I so admire (I even assigned Ilustrado for an undergraduate course on modern Asian literature I taught back in 2013!). 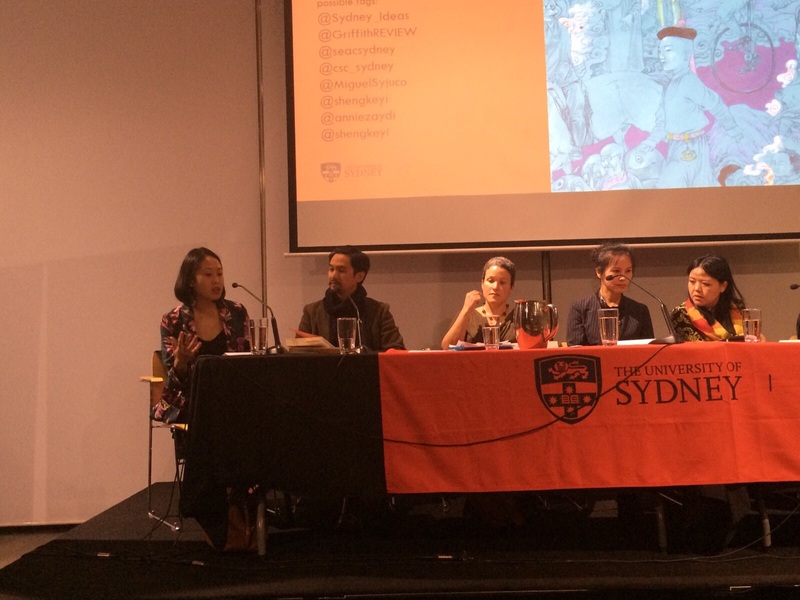 But more significantly, the New Asia Now event in Sydney helped me process the peculiar out-of-body sensation that attended my reading the New Asia Now issue. Frankly speaking, I felt (and admittedly still feel) the idea of an Asia-themed collection curated by Australians and published in Australia to be, well, rather weird—not to mention potentially neo-Orientalist. In illuminating the practical function afforded by physical and cultural remove when it comes to writing social and political commentary, the event invited me to be more gracious in my assessment, even if visceral suspicions still linger. Also worth consideration is the humility with which the New Asia Now issue professes to approach its task, for it is arguably this quality that makes this impetus to assemble an Asia-themed edition genuinely new. Although Australia has ostensibly attempted to establish good diplomatic and economic ties with its Asian neighbors since the end of World War II, only now has Australia begun to approach the matter with such deference and awe. Signaling this attitudinal shift was the “Asian Century” white paper released by the Australian government in October 2012, which stressed the need for Australia to become more Asia-savvy in light of Asia’s growing political, economic, and cultural clout. Funded in part by the government-supported national arts council—and referring explicitly to the Asian Century in its foreword—New Asia Now is undeniably the literary byproduct of this Australian about-face. But this is the same nation that has long possessed an unsavory reputation for xenophobia and condescension toward its Asian neighbors: there were the “White Australia Policy” measures that restricted non-European immigration until the mid-twentieth-century. There was Pauline Hanson’s 1996 parliamentary speech asserting that Australia was “in danger of being swamped by Asians.” More recently, a series of diplomatic fallings-out have occurred between Australia and Indonesia over the former’s perceived lack of regard for the latter. And every now and then the odd public display of anti-Asian sentiment (like this for example, or this) rears an ugly head. Schultz and Camens’s foreword may speak optimistically of “the tectonic mind shifts that are bringing the continents of Australia and Asia closer.” They may even go so far as to declare that “[t]he Anglo-Australians and Asian-Australians who submitted to this collection are as New Asia-centric in outlook as the authors who were born and raised in countries around the region” [emphasis my own]. But whether the border separating Australia from Asia—real or perceived—is truly so porous remains to be seen. At the very least, the simultaneous push and pull that characterizes Australia’s relationship with the Asia-Pacific region it is both part and not part of, may make Australia potentially effective as a site from which to write about Asia while remaining, in some sense (perhaps) within Asia as well. Tiffany Tsao is Asymptote’s Indonesian editor-at-large. Her fiction and poetry have appeared in Transnational Literature, Lontar, and the collection Contemporary Asian-Australian Poets (Puncher & Wattmann, 2013). She holds a PhD in English from UC Berkeley.